Custom metal storage containers and modular workshop containers. There are numerous applications that require robust metal containers for shipping or storage. Some of those applications require custom sizes or functionalities from metal containers. Applications are not limited to modular workshops, accommodation modules, power generation modules, and hydraulic power packs. A tank is also a type of container that may contain dangerous chemicals or food additives, containers come in all sorts of shapes and forms. The best material for a shipping container. Some applications require stainless steel shipping containers others need something light and to have corrosion resistance that can be fulfilled by the production of aluminium structures. Many people forget about this but Stainless Steel Container will be significantly heavier than Steel container as the material itself has more weight and it is also less strong when compared to carbon steel at room temperature. Stainless steel structures will need to be bigger in order to withstand the same amount of force and as result much heavier. Shipping containers or storage containers that are build from Aluminium may not be as strong as those welded from stainless steel or mild steel however they are up to 60% lighter in comparison. Protection of accommodation modules and modular workshops. Protection of metal containers is a big issue too as it directly impacts life expectancy of the item. Naturally, protection of metal container that is used to transport concrete around difficult areas of the site should not be as extensive as for accommodation module or modular workshop that will be shipped offshore and operate in the middle of North Sea. Costs are driven by the intended service life. Sometimes, the long service life of metal container may force reconsideration on materials cost that such metal container will be made of. 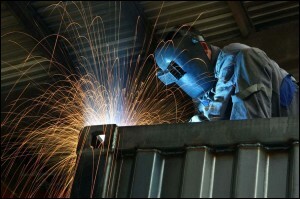 Stainless steel shipping container may be more expensive to produce, however, it will eliminate costs associated with bringing containers for shot blasting, repainting, refitting and putting it back in service overall lifetime of the equipment. Basically, you need to do your home work first. We do not know what application you have in mind, what ever it is, we can help you to bring your idea from concept into reality.